if it doesn't agree with experiment, its wrong. Phenomena that occur at very high pressures - thousands or tens of thousands of atmospheres - are often thought observed at atmospheric pressure in nanotubes and nanopores. Most notable is the nitric oxide dimer reaction 2NO ↔ (NO)(NO) having a dimer yield of less than 1 % at atmospheric pressure, but in nanopores or carbon nanotubes the yield is almost 100% as confirmed by magnetic susceptibility measurements. Assuming the dimers form under pressure, simple thermodynamic calculation shows that yields near 100 % can only occur at pressures of about 14,000 atmospheres – even though the open ends of the confined spaces are exposed to atmospheric pressure !!! Nevertheless, MD and MC simulations based on statistical mechanics confirm high pressure is the mechanism of producing the enhanced dimer yields. MD stands for Molecular Dynamics and MC for Monte-Carlo. But MD and MC simulations based on statistical mechanics assume atoms in the confined phase have classical kT thermal heat capacity. In contrast, QM by the Planck law restricts the atom heat capacity depending on its EM confinement. QM stands for quantum mechanics and EM for electromagnetic. Atoms in nanopores of a few nanometers in diameter are therefore under high EM confinement, and therefore have vanishing thermal kT heat capacity. Hence, the pressure P also vanishes. What this means is high pressures of 14,000 atmospheres, or the like, do not exist in nanopores and enhanced nitric oxide dimer yield is caused by another mechanism. Over the past decade, diverse chemical phenomena observed for confined nanophases and interpreted by high pressures may be more credibly explained by EUV photochemistry as illustrated for a carbon nanotube in the above figure and briefly summarized as follows. 2. 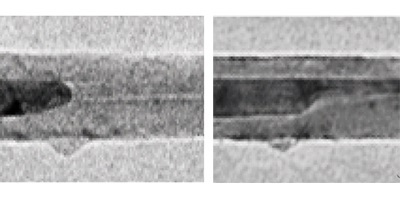 Interlayer Atomic Spacing Experimental small-angle X-ray scattering studies that show significant effects of the adsorption of a confined nanophase on the pore width are characteristic of computer chip etching in EUV lithography. 3. Melting of Water In confined water, the conflict between the energetic minimization of the hydrogen bond network and pore geometry is resolved as the hydrogen bonds are broken by EUV radiation. QM and not statistical mechanics governs our understanding of chemistry in confined nanophases. QM denies atoms heat capacity in the nanophase. Energy conservation proceeds by creating QED radiation in the EUV and beyond that by photolysis alters the chemistry of the contained gases and nanophase surfaces. Although dissociation of chemical bonds of gases is spontaneous in the nanophase, recombination is also prompt. In the nanophase, gases constantly fluctuate between ionization and de-ionization. 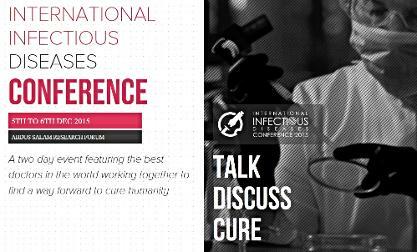 Under the umbrella of Abdus Salam Research Forum, the International Conference on Infectious Diseases will encompass important aspects of infectious diseases with particular attention being paid to the major challenges of the region including zoonotic diseases, malaria, tuberculosis, typhoid fever and diarrhea. In addition the increasing threat of HAI acquired in hospitals and healthcare facilities will be discussed at this meeting. HAI stands for hospital acquired infections. Although hand washing is promoted by the CDC and WHO as the cure-all for HAI protection, HAI have not been significantly reduced after many years of practice. This is so, because it is impossible for health workers to constantly wash their hands. No amount of training of health care workers can overcome the fact that hand washing simply is not practical. To illustrate the virtual impossibility of disinfecting HAI by hand washing, see the ICPIC video clip on Handwashing which is available directly from the www. In the manner of IIDC 2015, QED radiation in the UVC from ZnO nano particles embedded in disposable nitrile gloves to disinfect HAI offers an alternative to frequent hand washing. 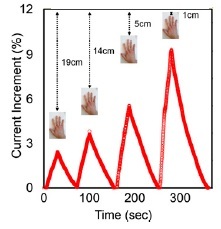 Finding basis in quantum mechanics, the UVC is produced from body heat in the fingers - no electricity is needed. Although promising, much research is required before QED induced UVC from disposable gloves becomes a viable alternative to hand washing. See Abstract and Presentation , the latter PPT requires the installation of Quick Time on your computer - you can download free from the www. The IIDC made Audio/Visual copies of my presentation, but the A/V file at 1.6 Gb is too large to show on-line. However, a the audio file Audio was extracted and with manual adjustment to the PPT of the Presentation provides a reasonable alternative for viewing and listiening. ICNSNT 2015 encourages the exchange of ideas between chemists, physicists, material scientists, biomedical researchers, engineers and other researchers who are active at the frontiers of this diverse and multidisciplinary field. Coverage extends from basic research in physics, chemistry and biology, including computational work and simulations, through to the development of new devices and technologies for applications in a wide range of industrial sectors (including information technology, medicine, manufacturing, high-performance materials, and energy and environmental technologies). To highlight the relation between nanotechnology and applications directly related to the common person, the QED disinfection of drinking water in hand-held bowls is presented. Only body heat is used to produce UV-C radiation that disinfects water borne pathogens. No electricity needed. The UV-C radiation used in disinfection is based on quantum mechanics and cannot be understood with classical physics. See updated Presentation and audio MP3 file including actual discussions. Manual synchronization is required. However, for the analytically minded, the validity of Molecular Dynamics in computational science is presented. Computational science intends to simulate what happens by quantum mechanics at the nanoscale, but has long since been nothing more than classical physics of the macroscopic world scale down to nanoscale dimensions. See updated Presentation and audio MP3 file including actual discussions. Manual synchronization is required. The Fourth Mode of Heat Transfer? An audio MP3 file is available of the presentation including the discussion with attendees. However, the PPT must be synchronized manually with the audio. Since 1995, nanofluids with suspended nano size solid particles have shown tremendous promise as heat transfer fluids. Since then, the mechanism of enhanced heat transfer in nanofluids has remained elusive. Recently, heat transfer is found enhanced by NPs in laminar flow of water through heated horizontal tubes by suppressing natural convection. NPs stand for nanoparticles. In order to explain the data, it was concluded that nanofluids may only be understood as two-phase media where nanoparticles move freely with Brownian diffusion neutralizing the thermal gradients necessary for natural convection. Brownian diffusion based on macroscopic particles moving in horizontal tubes follows classical physics. However, NPs < 100 nm are nanoscopic - not macroscopic. Therefore, QM – not classical physics - governs whether NPs can carry heat and neutralize thermal gradients. QM stands for quantum mechanics. Contrarily, QM given by the Planck law precludes NPs from carrying heat because the high EM confinement of the atoms causes their heat capacity to vanish. What this means is Brownian motion of NPs to carry heat and neutralize thermal gradients cannot be the mechanism of suppressing natural convection. In the alternative, NPs are proposed to suppress natural convection by emitting non-thermal QED induced EM radiation that passes through thermal gradient and upon absorption in tube walls enhances heat transfer, i.e., natural convection is indeed suppressed, but heat transfer is enhanced. QED stands for quantum electrodynamics. QED is a consequence of QM that denies atoms the heat capacity to conserve absorbed thermal energy from the nanofluid by an increase in temperature. Instead, the thermal energy absorbed by the NP is conserved by the emission of QED radiation. QED produces a steady source of non-thermal EM radiation in NPs from the thermal surroundings, the EM radiation produced from the UV to the VIS depending on the NP material and diameter. 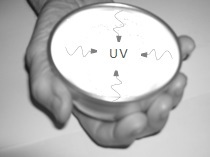 UV stands for ultraviolet and VIS for visible. 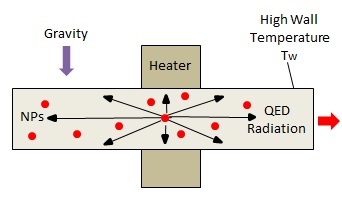 In the above figure, QED radiation is shown emitted from a NP at the center of the heater, although NPs in the tube removed from the heater are also emitting QED radiation, albeit at lower intensity. Of note, the experiment shows the wall temperature Tw near the exit to approach that at the heater which is difficult to explain as without NPs this does not happen. The QED explanation is that water transparent in the UV and VIS allows the QED radiation to pass down the tube to increase Tw upon being absorbed in the wall at the exit. Nanofluid enhancement of water depends on the NP material and size that has led to much confusion about the advantages, if any, of nanofluids over water alone. By NPs emitting QED radiation, nanofluids may be understood by the optical absorption properties of liquid water. NPs having, say n = 2 and d < 50 nm emit QED radiation at λ < 200 nm which is in the far UV and readily absorbed in water, and therefore should not show heat transfer enhancement. But for 100 > d > 50 nm, the QED radiation is in the UV and VIS that ealily penetrates water and should show enhancement. NPs having d > 100 nm produce QED radiation in the IR that is absorbed in water and should not show any heat transfer enahncement. However, aggregation complicates the QED explanation as increases in the size of the NPs can make NPs < 50 nm show heat transfer enhancement that otherwise would not be expected. Nevertheless, QED is the only nanofluid mechanism known today that relate NP size to enhanced or, as it may be, conventional heat flow limited by natural convection. Flow of fluids in nanochannels simulated by MD follows classical physics, but does not agree with experiments. MD stands for molecular dynamics. The Hagen-Poiseuille equation cannot explain the dramatic increase in flow found in nanochannels. Even if slip is assumed at the wall, the calculated slip-lengths necessary to explain the flow enhancement exceed the typical slip on non-wetting surfaces by 2 to 3 orders of magnitude. See Topical Problems in Fluid Mechanics above. 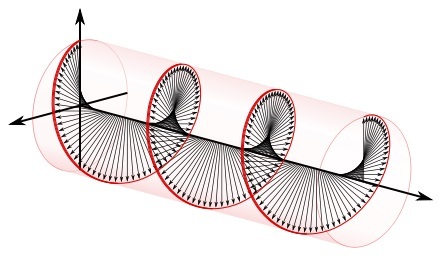 In solids, classical physics underlying kMC cannot explain how solid crystals in a nanotube under the influence of an electric current flow through a constriction that is smaller than the crystal itself as shown above. kMC stands for kinetic Monte Carlo. At the nanoscale the fluid or solid atoms are placed under EM confinement by that by QM requires their heat capacity to vanish thereby precluding the conservation of the heat of viscous frictional heat by the usual increase in temperature. EM stands for electromagnetic and QM for quantum mechanics. Hence, both MD and kMC based in classical physics that assume the atoms have heat capacity require modification for application at the nanoscale. Conservation of the heat at the nanoscale proceeds by QED inducing creation of EM radiation that ionizes the atoms to cause separation under Coulomb charge repulsion. QED stands for quantum electrodynamics. Since the 1940 s, physicists and chemists have been captivated by how shock waves can heat gases to several thousands of degrees in the time scale of a few molecular collisions with the thermal transfer of energy in the temperature range 1000 to 10,000 K. Indeed, shock waves have been long thought to be a convenient experimental method to study the response of gas molecules at high temperatures. However, the high temperatures could not be directly confirmed by measurement because sensors cannot be placed inside the infinitesimally thin shock thickness. Instead, gas temperatures were inferred from spectroscopic analysis of the frequency of EM radiation emitted from specific molecules assuming the molecules are in fact thermally excited. EM stands for electromagnetic. Generally, shock wave temperatures are calculated assuming the ideal gas law of classical physics. Indeed, the derivation of the shock temperatures are routinely performed by university students. For ideal diatomic gases initially at ambient temperature To = 300 K having specific heat ratio γ = 7/5, the shock wave temperature T at Mach 10 is about 6500 K, although monatomic gases produce temperatures near 10,000 K.
Closely related to shock temperatures is the shock thickness. Again, based on classical physics the shock thickness depends on the viscosity of the gases, the calculation of which is illustrated from Aerorocket. For air as a diatomic gas having viscosity µ = 1.6.6x10-6 m2/s, the corresponding shock wave thickness for diatomic gases at Mach 10 is about 6 nm. Vanishing viscosity occurs because QED conserves the viscous heat in the nanochannel by creating EM radiation that ionizes the fluid molecules to produces a flow of charged atoms as depicted in the above figure. The charged atoms.under Coulomb repulsion separate more than usual to give a vanishing viscosity. QED induced charged flow in nanochannels should therefore approach rhe frictionless flow given by the Bernoulli equation. The Bernoulli equation for the mass flow through nanochannels follows from the QED energy equation that excludes temperature changes as required by QM. Indeed, the Bernoulli equation provides a reasonable QM approximation to the flow in nanochannels that avoids the complexity of MD solutions. With the exception of water, the measured flow is close to but less than that predicted by the Bernoulli equation. See data in Paper on "The end of nanochannels"
However, MALDI research in 2006 shifted from Tanaka’s simple NP matrix to complex organics. Then as now, the problem is to explain MALDI ionization of analytes having IPs > 8 eV with nitrogen UV lasers having single photon energy of only 3.68 eV. IP stands for ionization potential. Since multi 2 photon and even 3 photon processes necessary to reach 8 eV ionization levels are highly unlikely, there is yet no rational mechanism known to explain how analytes ionize in MALDI. In this arrangement, analytes are proposed to ionize in MALDI as NP matrices absorb the nitrogen laser energy and emit non-thermal QED induced EM radiation at EUV levels. QED stands for quantum electrodynamics, EM for electromagnetic, and EUV for extreme ultraviolet. QED is a consequence of QM that denies atoms in NPs the heat capacity to conserve absorbed EM energy by an increase in temperature. QM stands for quantum mechanics. Instead, the absorbed laser energy is conserved by QED producing EM radiation at the frequency of standing waves that span NP diameter. 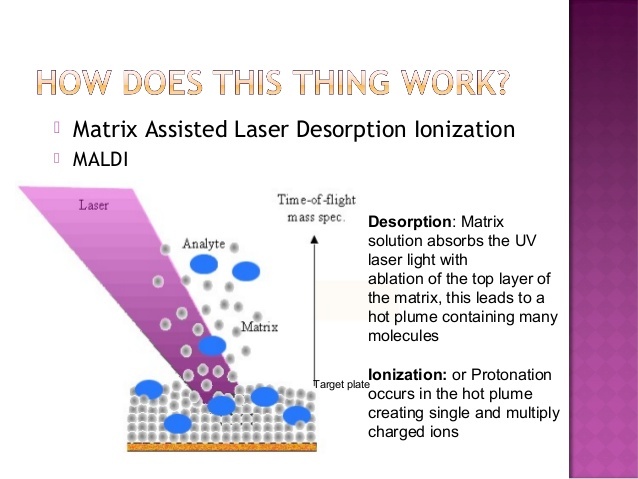 In NP assisted MALDI, the absorbed UV laser energy is almost totally confined in the NP surfaces because of their high surface to volume ratios. Upon absorbing nitrogen laser energy, NP atoms are spontaneously placed under temporary, but high EM confinement. 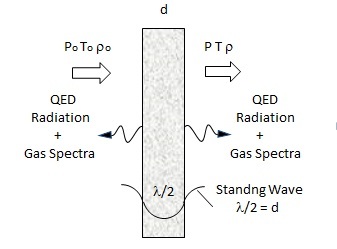 Since the temperature cannot increase by QM, QED converts the surface energy into standing EM waves having half-wavelength λ/2 equal to the NP diameter. Because the NP diameter is of nanometer dimensions, the QED radiation wavelength λ has Planck energy E = hν in the EUV to exceed the ionization potential of the analytes, where h is Planck’s constant and ν is frequency. Here, ν = (c/n)/ λ with λ = 2d, where c is the velocity of light, with n and d being the refractive index and diameter of the NPs. QED induced EM radiation of 13.8 eV from 30 nm cobalt NPs ionized the analytes in Tanaka’s MALDI experiment, although with smaller NPs, QED produces EUV radiation by simply irradiating the NP matrix with a nitrogen laser. There is no need in MALDI for mass spectrometry based on organic matrices. QED Induced UV Radiation to Supersede LED's ? 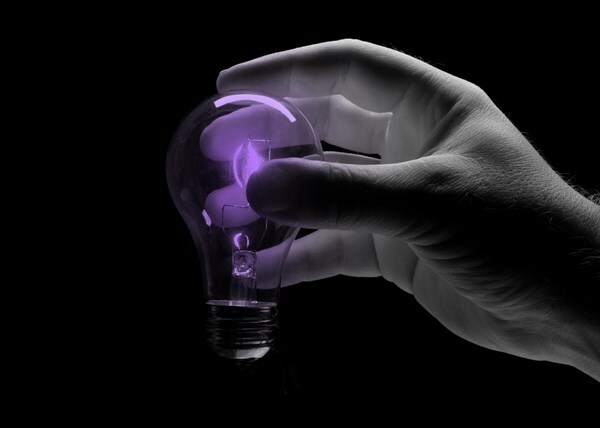 Today, LED UV lamps are thought to hold the future in disinfection. LEDs stand for light emitting diodes. LED lamps run coolder than the traditional metal halide lamps as shown held in the fingers of a hand. Regardless, LED's still require a source of electrical power. LED lamps in the UV-A do have a high EQE, but in the UV-C are limited to EQE of a few percent. EQE stands for external quantum efficiency. Since UV-C is requred for disinfection of water pathogens and the Ebola virus, LED's are not expected to impact the disinfection market until 2017/2018. In contrast, the QED drinking bowl has 100% efficiency, but is limited by low body heat. Today, infectious diseases including SARS and H1N1 continue to haunt Hong Kong. SARS stands for severe acute respiratory syndrome and H1N1 for human swine flu virus. Since 2003, SARS was identified by the WHO as a corona virus family never before seen in humans. SARS is spread by droplets from sneezing and coughing, but may be transmitted by touching contaminated objects. In fact, infectious diseases are usually transmitted through the hands by touching public surfaces. The hands then pass the virus into our bodies upon rubbing our eyes, nose or mouth before washing our hands. In Hong Kong, over 2.5 million commuters use the public transit system every day, and can easily spread infectious viruses to each other by contacting grab poles and handrails commonly used to hold and avoid falling under abrupt train car and bus motions. In this regard, the Hong Kong authority constantly reminds commuters through automated announcements to hold the handrail and grab poles when the train or bus is moving. Regardless, avoiding touching handrails and grab poles is almost impossible making the transmission of infectious viruses by contacting public surfaces a virtual certainty as shown below. In 2006, handrails in Hong Kong trains were disinfected by applying a spray of NSTDC to public surfaces to avoid the transmission of infectious viruses. NSTDC stands for nano silver-titanium dioxide coating. All escalator handrails, the buttons on ticket issuing machines and all handrails and buttons in elevators including grab poles in train cars and buses were coated. More recently in 2010, an anti-microbial coating was developed that is thought to set a new standard in the disinfection of infectious viruses. Transparent, colorless and odorless, this smart coating can sustain surface disinfection by simply spraying on public surfaces. Compared with conventional disinfecting coatings, the smart coating is effective for at least 30 days. Test results show the smart coating can kill 99.9% of bacteria within 1 minute and 99% of the H1N1 virus within 3 minutes. The effectiveness of the smart coating is significantly longer than with conventional disinfectants, many of which will lose their function as they evaporate. On the other hand, laboratory tests showed smart coatings are indeed capable of long-term disinfection with 100% effectiveness even after 30 days. The smart coating is not permanent and can be removed by washing off with detergent-in-water solution. However, spray coatings of handrails and grab poles offer only a temporary solution. Future public transport systems may require redesigning the grab poles and handrails with permanent coatings. Moreover, the sprayed coatings containing colloidal silver are claimed non-toxic, but nano-silver that comes off and enters the body damages the DNA and can cause cancer. Alternative handrail and grab pole designs using permanent nano-coatings emitting UV-C radiation are suggested. With regard to hand poles, QED induced EM radiation emitted from the surface is produced from electrical heaters provided inside the poles is proposed to provide a steady source of UV-C from which ALL infectious viruses may be disinfected. QED stands for quantum electrodynamics, EM for electromagnetic, and UV-C for ultraviolet radiation at 254 nm. During fabrication, the grab poles would be provided with a permanent 50-60 nm ZnO coating that can be periodically cleaned to minimize pathogen residue. 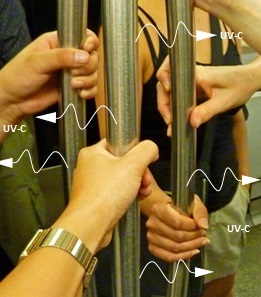 The UV-C from a typical grab pole arrangement is illustrated below, but the electrical heaters inside the poles are not shown. On the other hand, QED disinfection of hand rails on escalators as shown above does not require electrical heaters as frictional heating of running the hand rail is sufficient to produce the UV-C. Application of nano coating of zinc oxide or titanium dioxide on the handrail surface is required for QED to continuously create the UV-C to disinfect the handrail. The UV-C is depicted to be emitted from the hand rail shown in the above figure of an escalator. Smartphones are commonplace all over the world. Unfortunately, the touchscreens provide a natural way to transmit infectious viruses acquired in touching public surfaces . Similarly, computers in public libraries allow viruses to be transmitted between people through the fingers. 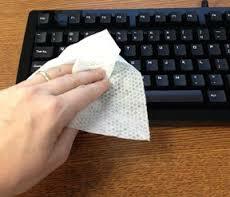 In Hong Kong, computer keyboards in public libraries are disinfected 4 times a day because of the long standing fear of the SARS and H1N1 viruses as shown below. However, if only you use your Smartphone, you're probably pretty safe from the spread of viruses from others. But as soon as you touch public surfaces such as hand rails and poles in Public Transportation trains and buses, viruses start accumulating on your phone’s touch screen that can make you ill. Periodic cleaning would remove the pathogens, but can damage your phone. But bacteria like clostridium difficile (which can cause diarrhea or even inflammation of the colon) and flu viruses may require a sterilizing agent like bleach or alcohol, but this is not done for fear of damaging the touch screen. Recently, disinfecting Smartphones with soap or bleach is claimed to br replaced avoid erseded by the PhoneSoap Charger using UV-C lamps. The phone is placed in a compartment (153 mm x 95 mm x 20 mm) for about 4 minutes. Heat, liquids, and chemicals that can damage the phone are not used. Of note, UV-C lamps and not LEDs are used in the PhoneSoap Charger. Currently, LED’s in the UV-C are limited to EQE of a few percent  and not expected to impact the disinfection market until 2017/2018. EQE stands for external quantum efficiency. LEDs are used to produce UV-A and –B, but the disinfection capability is reduced compared to UV-.C. Longer exposure times are required to reach the dosage necessary for disinfection. QED induced EM radiation emitted from the touch screen of Smartphones from body heat or that dissipated by the electronics itself is proposed to provide the UV-C from which infectious viruses may promptly be disinfected. Instead of the 4 minutes required for PhoneSoap Charger disinfection, QED disinfection only takes a few seconds. QED stands for quantum electrodynamics, EM for electromagnetic, and UV-C for ultraviolet radiation at 254 nm. Phone touch screens would be provided with a permanent 50-60 nm ZnO coating that can be periodically cleaned to minimize pathogen residue. 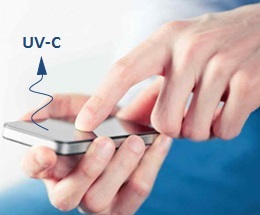 The UV-C from typical Smartphones provided with a nano-coated touch screen is depicted in the above figure. The ZnO nano-coated touchscreen is similar to the recently proposed QED induced disinfection of viruses from handrails and grab poles in Public Transportation train cars and buses in Hong Kong. In conclusion, QED induced UV-C radiation from body and electronics heat offers the advantage of continuous disinfection of diseases from being transmitted by touchscreens of Smartphones. No additional heat is necessary. The much publicized superiority of LEDs in the UV-A and B over conventional lamps is not yet proven for UV-C disinfection. Even if UV-C LEDs are developed, QED induced UV-C disinfection is far simpler as a ZnO nano-coating positioned near the pathogen only needs to be driven by body heat and at most small mW electrical heaters. In Public Transportation train cars and buses, Smartphones are used by almost all passengers all the time. What this means is passengers themselves may use QED induced UV-C from their Smartphones to disinfect viruses they acquire upon touching hand rails and poles, as they must to avoid falling during sudden train and bus motions. Currently, WHO/UNICEF estimates almost 1 billion people in the developing world do not have access to safe drinking water. Moreover, about 2 million childhood deaths have been attributed to water-borne diseases. Conventional water treatment is unfeasible because of costs. Lacking municipal water supplies, the water is collected from rivers or lakes and stored in containers for later use which may also be contaminated. The most direct way of purification is by boiling small quantities of water, but this requires a source of heat which, except for fire, is usually not available. Because it is not always convenient to build a fire, it is highly desirable to consider alternative low-cost methods for purifying water. Unfortunately, there are no known low-cost alternatives to purifying water other than by boiling. However boiling has disadvantages because a source of heat is needed. One could envision focusing sunlight to boil small volumes of drinking water, but the purified water would only be available during daylight hours. If, however, portable electrical power is available, the water could be pumped through ceramic or resin filters coated with silver NPs. NP stands for nanoparticle. Silver NPs are widely known to provide antimicrobial action by damaging the DNA of bacteria, but NPs that come off the filter and enter drinking water also damage human DNA, that if not repaired, may lead to cancer. Regardless, NP coated filters are unfeasible because electrical pumping power is usually not available. In contrast, UV disinfection of drinking water occurs outside the body and avoids the danger of cancer posed by silver NPs, but is unfeasible as electrical power is generally not available and costly even if available. The developing world needs an inexpensive way of purifying drinking water. QED induced UV radiation using nano-coated drinking bowls is proposed as the mechanism by which drinking water is purified inexpensively without electrical power. QED stands for quantum electrodynamics. QED induced purification is a consequence of QM that forbids the atoms in nano-coatings under TIR confinement to have the heat capacity to increase in temperature. QM stands for quantum mechanics and TIR for total internal reflection. On November 6, the IUVA held a one-day symposium on the UV disinfection of water in the developing world at UNESCO-IHE in Delph, Netherlands. See Advertisement New developments in UV sterilization of water proposed LED sources as a replacement for mercury discharge. However, the water bowl UV disnfection of water is far more efficient than LEDs as no electrical power is required. Funding of water bowl research was discussed with attendees. The October issue of Physics Today reported electron-spin measurements at N-V defects in diamond allows resolution of temperatures from 300 to 650 K at mK accuracy. 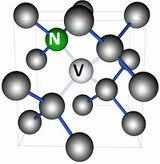 N-V stands for nitrogen-vacancy as shown in the above figure. But the supporting experiiments for were based on bulk mm-scale diamond crystals  not NDs. ND stands for rnanodiamond. Hence, N-V spin level thermometry in mm-scale diamond crystals is indeed feasible in temperature measurements at the macroscale, but thhe crystals are too large to measure temperatures inside living cells having dimensions of a few 10's of microns. Instead, NDs of 100 nm size implanted in living cells are proposed to measure cell temperatures. Unlike the bulk mm-scale diamond, QM denies the atoms in NDs the heat capacity to allow temperature changes to occur thereby refuting the claim that ND temperature can be measured from thermal strains in mm-scale diamond samples. QM stands for quantum mechanics. Thermal strains in NDs are therefore not the same as in the mm-scale crystals making the HD thermometry of living cells highly questionable. QED induced EM radiation is proposed as the mechanism by which the local thermal energy of the living cell is conserved in NDs without temperature changes. QED stands for quantum electrodynamics and EM for electromagnetic. QED induced radiation is a consequence of QM that denies the atoms in NDs under TIR confinement to have the heat capacity to allow changes in temperature. TIR stands for total internal reflection. Indeed, classical heat transfer of NDs shows uniform temperatures throughout that almost spontaneously follow the local cell temperature. QM differs. Since the ND temperatures cannot change by QM, the local thermal energy acquired from the cell may only be conserved by QED creating EM radiation in the ND having Planck energy E = hf, where h and f are Plancks constant and the TIR frequency of the ND. Since NDs have high surface to volume ratios, almost all of the local thermal cell energy acquired by the ND directly excites its TIR mode. In effect, TIR confines the acquired cell energy to the ND surface having a wavelength given by its circumference. But how then may the ND infer local temperature in the living cell? By QM, local cell temperatures are inferred by N-V spin-flips from thermal strains induced in the ND as only the temperature of the surface changes. Atoms in the interior of the ND do not increase in temperature, but the surface atoms do indeed follow the cell temperature. Unlike uniform thermal expansion predicted by classical physics, expansion of the ND surface strains the interior N-V centers. Diamond noted for sensitivity to strain is therefore correlated by QM to the local cell temperature, the correlation of which cannot be deduced from the uniform ND temperatures predicted by classical physics.See PressRelease . Although QM allows NDs to measure cell temperatures, the toxicity of the EM radiation at UV frequencies emitted from the NDs is likely to damage DNA within the cell and should be considered in cell temperature measurements. Since the 1980's, the oxidative catalysis of natural gas or methane to ethylene, aromatics, and hydrogen including propylene, benzene, toluene, and naphthalene has required oxygen at high temperatures > 1073 K. Beyond the low 50% carbon utilization efficiency, oxygen leads to the over oxidation product of CO2 which is not environmentally friendly. Today, many catalysts to avoid the oxidative conversion of natural gas have been proposed, but none are yet economically available. 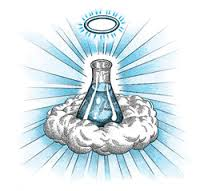 Indeed, catalysts have long been considered the Holy Grail of chemistry. In the conversion of methane gas to ethylene, the Holy Grail is a catalyst that can activate the first C–H bond of methane without oxidation. But it is very challenging, if not impossible for any catalyst as 4.35 eV is required to cleave the C-H bond while methyl radicals at 9.84 eV only form at the 12.6 eV ionization potential of methane. Recently, Science contrary to the requirement of 12.6 eV ionization potential reported the direct nonoxidative conversion of methane at the relatively high efficiency of 50% at 1363 K. The catalytic mechanism thought to explain the remarkable methane conversion efficiency without the formation of CO2 was based on passing the methane over a surface comprising single iron sites embedded in a silica matrix, the iron sites being 2-5 nm nanoparticles. Nanoconfinement of the iron sites in the silica surface was thought to initiate the catalytic generation of methyl radicals, followed by a series of gas-phase reactions. Experimentally, the methyl radicals including the aforementioned methane reaction products were clearly observed with ultraviolet spectroscopy, Ibid. Theoretical support of the series of gas-phase reactions at 1225 K was simulated with DFT by assuming the nanoconfinement mechanism somehow formed a pair of methyl radicals at 9.84 eV. DFT stands for density functional theory. The DFT simulation showed the methyl radical pair to combine in a strongly exothermic process to produce ethylene, but otherwise leads to all of the methane reaction products. The problem is the DFT simulation may explain how methyl radicals once formed combine to produce the methane reaction products, but does not explain how the nanoconfnement mechanism of iron sites in the silica surface produces the 9.84 eV necessary to form the methyl radicals. A catalytic mechanism capable of ionizing the methane molecule at 12.6 eV is required. QED induced radiation is proposed as the catalytic mechanism capable of ionizing the methane molecule. QED stands for quantum electrodynamics. Finding basis in the QM requirement that the heat capacity of the atoms in the iron sites vanishes at the nanoscale, heat absorbed by the iron site from the silica matrix cannot be conserved by an increase in temperature. QM stands for quantum mechanics. Instead, conservation proceeds by the QED induced frequency up-conversion of the absorbed heat by the iron site to non-thermal EM radiation at its TIR confinement frequency. EM stands for electromagnetic and TIR for total internal reflection. QED induced catalysis by nanoparticles is not new. See ChinaCatalysis Indeed, the EM radiation having Planck energy beyond the UV is sufficient to ionize methane molecules that come near the iron site. See numerous QED applications on this web page. 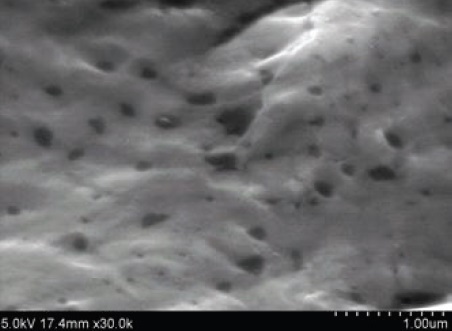 However, the QED induced catalytic conversion of methane by iron sites in a silica matrix may be significantly enhanced by flowing the methane through a cylindrical reactor provided with a removable liner comprising a nanoscale iron coating on a silica substrate, the substrate having a thickness of a few 10s of microns as shown the thumbnail. The liner may be formed by rolling-up a flat geometry where it is more convenient to control the nano coating thickness. A surface heater supplies the heat Q to the nanoscale iron coating, but by QM the nano coating cannot increase in temperature. In are:stead, QED induces the heat to be converted to EM radiation that ionizes the methane to produce the methyl radicals that initiate the formation of ethylene. See PressRelease . 1. The catalytic nature of nanoparticles by QED induced radiation is not new. The QM restriction of vanishing heat capacity of atoms in nanoparticles requires the conservation of any form of absorbed EM energy by the emission of QED radiation that enhances chemical reactions. .
2. QED induced radiation based on QM having the capability of ionizing natural gas explains the remarkable efficiency in catalytic surfaces comprising iron nanoparticles in a silica matrix is indeed the Holy Grail of catalysis..
3. By QED radiation, conversion efficiency may be significantly improved by flowing natural gas through a cylindrical reactor provided with a removable liner comprising a nanoscale iron coating on a silica substrate, although other more suitable materials may be used. The QED radiation wavelength depending on the thickness of the nano coating may be tailored to excite the desired quantum state of the flowing gas molecules simply by providing a set of liners with differing nano coating thicknesses. China’s massive population poses difficult environmental challenges for a nation of some 1.2 billion people. Indeed, water pollution and waste management are among the most pressing issues. Over 3.5 million tons of sewage waste per day requires extensive treatment facilities. Perhaps half of all Chinese — 600 million people—drink water that is contaminated by human waste are subjected to waterborne pathogens and a myriad of human health concerns. But contaminated drinking water is not unique to China. WHO/UNICEF estimates almost 1 billion people do not have access to safe drinking water. Although visitors to China generally do not stay long to expose themselves to health risks from heavy metals, they almost all will meet "La Dudza" - the Chinese version of diarrhea within their first days after arrival. The WHO estimates that 64% of all premature deaths in China are related to water-borne toxins consumed on a regular basis by a majority of the nation's population that cannot afford bottled water, and even if bottled water is available the consumer at the point of use never knows if it is indeed safe. The most direct disinfection is by boiling at the point of use, but except for water boiling units in restaurants is not available to the individual consumer. Unfortunately, there are no known low-cost alternatives to purifying water for the individual other than by boiling. Even if tap water becomes drinkable, few people will stop boiling drinking water, a habit that is ubiquitous in China. Alternative water disinfection is desirable. Currently, LEDs in the UV-C are thought to provide the individual with point of use disinfection of drinking water, but still require a source of electrical power. LEDs stand for light emitting diodes. However, LED’s in the UV-C are limited to EQE of a few percent and not expected to impact the disinfection market until 2017/2018. EQE stands for external quantum efficiency. In contrast, the QED drinking bowl has 100% efficiency, but is limited by low body heat. .
QED induced disinfection of drinking water is a consequence of QM that precludes the atoms in nano-coatings to have the heat capacity to conserve body heat by an increase in temperature. Instead, the heat is induced by QED to produce UV radiation. The US HEW set guidelines for UV light disinfection to require a minimum dose of 16 mJ / cm2 at all points throughout the water disinfection unit, but recently the National Sanitation Foundation International set the minimum UV light requirement at 38 mJ / cm2 for treat visually clear water. Currently, QED induced disinfection of drinking water is currently under development. Prototypes comprise a 1 mm thick half-sphere aluminum bowls (100 mm diameter x 50 mm high) that fit into the palm of one hand as shownin the above figure. Melamine and glass bowls were considered, but have a low thermal conductivity compared to aluminum which is important to take advantage of the 12 C differential between body temperature (32 C) and ambient (20 C). Moreover, melamine and glass are fragile compared to the ductility of aluminum to avoid fracture upon accidental dropping. According to QED theory, a 53 nm ZnO nano-coating consistent having a refractive index of 2.4 therefore converts 100% of body heat 5.71 mW / cm2 to UV-C. See Presentation and Paper. Over the past decade, the ICTEA conference series has provided an opportunity for professional development of scientists and engineers in the Middle East, including the Gulf region and North Africa. Prior conferences were held in Amman, Marakesh, Istanbul, Abu Dhabi, Beirut, and the UAE. It is only fitting the 8th ICTEA conference is being repeated in Amman at the German-Jordanian University. 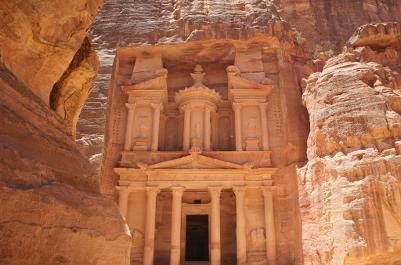 Petra - one of the seven wonders of the world - pictured above is a 3 hour drive from Amman. Of interest to QED induced EM radiation is the topic of disinfection of drinking water in the developing world. At ICTEA 2015, the status of using body heat to disinfect small quantities of drinking water in a hand-held nano coated half-sphere bowl is presented in relation to other ongoing presentations. The disinfection of the Ebola virus using QED induced UV-C radiation from hand-held zinc oxide nanocoated bowls was presented last month at the at Nanotechnology Conference in Dubai as shown below. Extending the bowls to the disinfection of drinking water was suggested, but the toxicity of zinc leaching into the water was raised. In this regard, simply anodizing the bowls to form an aluminum oxide coating was investigated as an alternative to the zinc oxide coating. Although the operating principle for Ebola is the same as for water disinfection, the instant ICTEA presentation updates the development status from that presented in Dubai. 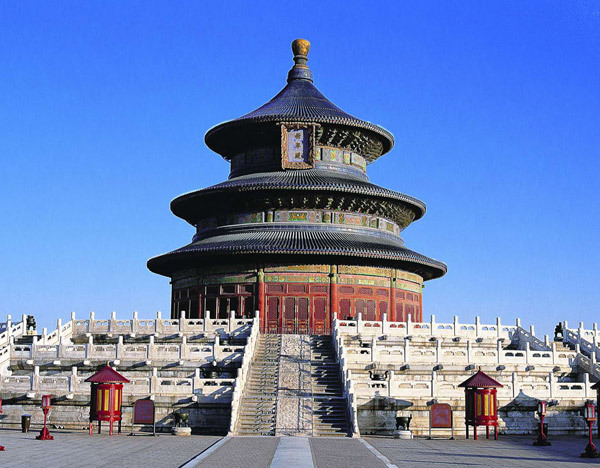 Because of the ongoing development, similar presentations of drinking water disinfection are planned for the WRE and ICPIC conferences in Beijing and Geneva later this year. The decision on the toxicity of zinc or aluminum oxide coating is yet to be made. Also, an audio MP3 file of the Presentation may be played, but requires manual synchronization. The discussion following the Presentation is also included in the audio file. The Ebola virus outbreak is a worldwide concern. the CDC has issued guidelines for how Ebola is to be disinfected in hospital and healthcare centers. CDC stands for Center for Disease Control. Currently, robotic UVGI systems are proposed to decontaminate healthcare facilities. UVGI stands for Ultraviolet Germicidal Irradiant. Hospital staff controls the robot, but vacate the room during the application of UVGI light pulses that continue for 5 minutes. Greater flexibility is provided with hand-held UVGI systems that allow mobile and rapid disinfection of Ebola on surfaces and the surrounding air. Electrically powered 400 W hand-held devices producing a blade-like UV-C light beam (50 mm wide x 500 mm high) achieves 99% reduction of the Ebola virus in 5 seconds. Large areas are decontaminated using slow scanning of the UV-C light beam. The UVGI systems disinfect Ebola including Tuberculosis and Lassa by irradiating surfaces and air using 254 nm UV-C light. But UV-C disinfection may be used for other pathogens, e.g., the CDC states that about 1 in 20 patients have an infection while receiving health care treatment in U.S. hospitals. Disinfecting health care facilities of all pathogens is challenging scientists to develop more advanced technology for better disinfection. However, the recent Ebola outbreak in West Africa highlights the inability of countries in the developing world to control the spread of the Ebola virus. Indeed, the protocol for Ebola disinfection available in the U.S. is too complex and costly. Simply put, lack of money has hampered healthcare facilities and personnel from controlling the spread of the Ebola virus. In the developing world, robotic and manually operated UVGI systems in the U.S. are simply too costly let alone requiring sources of electricity which are usually not available. The QED induced UV-C radiation from the Ebowla is especially suited for disinfecting the Ebola virus in the developing world that lacks sources of electricity. Costs are minimal allowing the Ebowla to be distributed to individuals by governments without costs. Moreover, the Ebowla may also be used to disinfect drinking water. But even in the U.S. and the developed world, the Ebowla would allow simple germicidal disinfection for nurses in hospitals or the public in their homes as well as assuring drinking water is free of pathogens. Where drinking water disinfection is not so important, the Ebowla may be replaced with a flat nano-coated surfaces, say carried in the pocket of a nurse or worn as a badge. 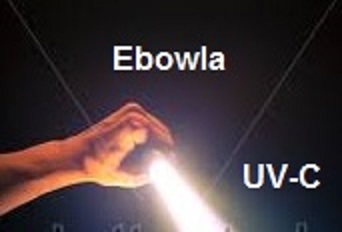 Ebola disinfection by QED induced UV-C from body heat using hand-held Ebowlas is new, but not the use of body heat to power electronics. Recently, body heat in holding a flashlight was shown to produce light. Peltier cells were built into the flashlight's casing to absorb body heat from a person's hand. Although QED induced radiation is far more efficient than the Peltier effect, only monochromatic light for a given coating thickness is produced. Therefore, using QED to make, say red flashlights is possible, but not white light comprising a mix of frequencies. Whether the nano-coating thickness can be structured to produce QED induced white light remains to shown. Nanotechnology-2015 held in Dubai will provide researchers and others in the Nanotechnology field the ability to interact and advance their work through various speakers and workshop sessions. Nano science, Nanotechnology along with Materials Science are becoming more extensively known as a specific field of science and engineering. Scientific Future Group aims to bring together the prominent researchers, engineers and scientists through collaboration and the exchange of ideas and knowledge. Nanotechnology-2015 offers a tremendous opportunity for researchers; practitioners and industrial scientists to represent a diverse multi disciplinary range of sciences to meet and discuss the cutting edge topics of nanotechnology and materials science the research in which they are utilized presently. The congress includes Keynote lectures and invited talks by eminent personalities from around the globe in addition to contributed papers both oral and poster presentations. Nanotechnology-2015 will focus on many interesting scientific sessions and covers all frontier topics in nanotechnology and materials science. On behalf of Nanotechnology-2015, Scientific Future Group is glad to invite contributions from the enthusiastic scientists to organize International Workshops/Symposiums that are both empirical and conceptual in exploring new dimensions in this field. It is open to all types of research methodologies both from academia and industry. Specifically, how can Nanotechnology disinfect dangerous viruses such as the Ebola virus in West Africa? In this regard, see Abstract/Bibliography and Presentation An MP3 audio file of the PPT presentation may be heard, but you have to synchronize by yourself. Please ignore the problems with the fallen microphone and listen to the audio. oday, the quantum confinement of the exciton to the Bohr diameter forms the basis for much of the theory governing the optical phenomenon observed in nanostructures. Common nanostructures are the QD and QW corresponding to the quantum dot and wire, respectivley. Recently, QCs were observed upon irradiating a nickel coated silicon. See Paper. 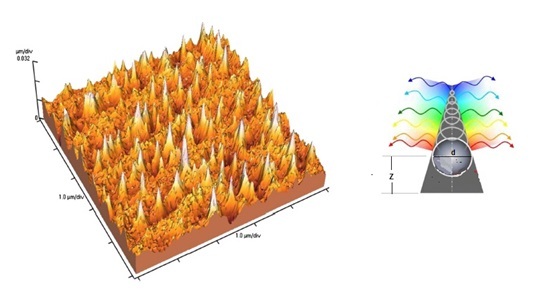 QCs stand for quantum cones depicted in the above AFM image. The QCs produce a PL spectrum because the exciton (electron and hole pair) undergoes quantum confinement to its Bohr diameter at that fits inside the QC. PL stands for photoluminescence. Since the QC diameter decreases from the substrate to the tip, the QC may be considered a graded band gap device. The above figure shows a QC with a gradually increasing band gap Eg in terms of the Bohr diameter d depending on the height z from the substrate. The band gap Eg is given, Eg = h2ζ 2m*/(2π2d2), where h = Planck’s constant, ζ = 2.4048, and m* is given by 1 / (m*) =1 / (me*) + 1 / (mh*). Here, me* and mh* are the effective electron and hole masses. The PL mechanism by QED theory claims QCs form as melted silicon flows upward through openings in the nickel layer. However, QM forbids atoms in the QCs to acquire melt temperatures. What this means is the heat in the silicon flowing through the QCs is not conserved by an increase in QC temperature, but rather by QED inducing the creation of EM radiation in the TIR mode in the QC surface. TIR stands for total internal reflection. EM radiation is confined to the circumferential direction the QC surface. The QED radiation created in the QCs has TIR wavelength λ = π d and frequency υ = (c/n)/λ, where c is the velocity of light and n the refractive index of the QC. Hence, the QED radiation creates the excitons that upon recombination emit the PL having Planck energy E = hυ = hc/πnd. A review shows exciton confinement in a QC based on theory developed for the QD and QW gives vanishingly small Bohr diameters at optical frequencies. Indeed, the peak PL response ( E = 2.9 eV and λ = 430 nm) requires a Bohr diameter d < 1 nm. See Paper, Fig. 1 (b). However, the AFM image above generally shows larger QC diameters, say 150 nm at the base with a height of 50 nm. Hence, PL emission occurs at the very tip of the QCs by the Bohr theory. QED theory differs. Assuming a refractive index n = 4 for silicon, the peak PL emission at λ = 430 nm therefore occurs at a QC diameter d = 34 nm, or at about 11 nm from the QC tip and 39 nm above the substrate. In summary, quantum confinement by Bohr theory suggests peak PL spectrum emission occurs at the very tip of the QC. But QED theory places the peak PL further away from the tip that appears more consistent with observed QC emissions. Smaller QC diameters are expected for Bohr confinement of the exciton compared to QED because the electron has far lower energy than the photon under TIR confinement. Moreover, QED confinement constrains absorbed EM energy to the well defined surface of the nanostructure, a condition consistent with the high surface to volume ratio of nanostructres. Hence, QED theory avoids the nebulous quantum confinement of the electron in the Bohr theory of the exciton. Absorption spectra of gases usually show a symmetric shape about resonance lines. In 1935, Beutler observed the spectral absorption of some lines of the noble gases showed sharp asymmetric shapes. Ugo Fano pictured above proposed the asymmetry was caused by the QM superposition principle. QM stands for quantum mechanics. Fano resonance in NS containing a small number of atoms is analogous to that observed in gases. NS stands for nanostructures. However, there are problems with the analogy. One problem is the atoms in NS require a source of auto-ionization such as UV radiation, but only IR radiation is used in Fano experiments. Moreover, Fano resonance in NS based on plasmons derived with Maxwell's equations are questionable because the NS atoms are required to undergo auto-ionization which is not possible with IR excitation. Another problem is how does auto-ionization of NS atoms proceed, as it somehow does, if only IR radiation is used in Fano experiments. For example, the application of surface plasmons to the dynamics of a circular disk inside a ring produces a response of symmetric and asymmetric plasmons that are thought to combine to produce the asymmetric Fano resonance, but the source of auto-ionization is not described. In this regard, QED induced EM radiation beyond the UV is proposed produced from IR light. QED is based on the QM interpretation of the atom as a harmonic oscillator that precludes the atoms at the nanoscale from having the heat capacity to conserve absorbed EM energy by an increase in temperature. 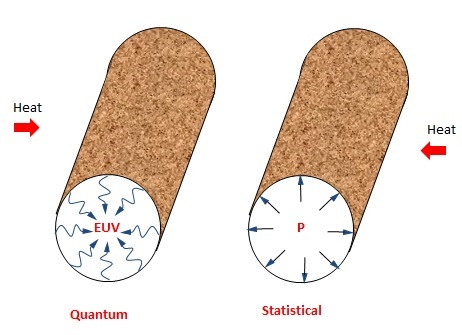 Maxwell's equations that exclude QM are therefore invalid in plasmonic simulations in NS. Instead of temperature increases, QED conserves the EM energy by frequency up-conversion to the TIR resonance of the NS which in NS is beyond the UV as required for auto-ionization. In conclusion, the Fano resonance is the consequence of QM that precludes the atom from having the heat capacity to conserve EM energy by an increase in temperature. Instead, conservation proceeds by the QED induced frequency up-conversion of IR radiation beyond the UV to auto-ionize the NS atoms - a necessary condition to observe the Fano resonance. With the NS atoms auto-ionized, the NS responds to IR excitation in a symmetric absorption shape, but interference from quasi-bound states of individual atoms created by auto-ionization produces the superposed asymmetric Fano resonance shape. Plasmon solutions by Maxwell’s equation in NS are not valid by QM and need to be reviewed. The 3rd International Conference on Prevention & Infection Control (ICPIC), to be held fin Geneva rom 16 to 19 June 2015. ICPIC provides a unique forum for the exchange of knowledge and experience in the prevention of healthcare-associated infection and control of antimicrobial resistance around the world. Though advances in infection control and prevention are being made, antimicrobial resistance persists as a global threat confronting all countries alike. Of particular ICPIC interest is the recent disinfection of the Ebola virus in West Africa including the long-standing problem of the disinfection of water borne pathogens in drinking water common throughout the world, especially in China and India. In this regard, QED induced disinfection is proposed to provide people in the developing world with a means to disinfect both the Ebola virus and drinking water themselves using UV-C radiation from hand-held nano-coated bowls powered only by body heat. Electricity or batteries are not required. The ICPIC Innovation Academy allows investigators to participate in a forum which brings together innovations in the practice of infection control. Innovation stems from Latin - innovatus - which requires a new way of applying discovery. Unlike classical physics, QED disinfection is based on quantum mechanics that precludes body heat from being conserved by increasing the temperature in nanoscale coatings because the heat capacity of the atom vanishes. In contrast, classical physics allows the temperature to increase in nanoscale coatings as the atom is erroneously assumed to always have heat capacity. By quantum mechanics, conservation of body heat proceeds by the emission of non-thermal EM radiation. Proper selection of the nanocoating material and thickness allows the EM emission to be tuned to the UV-C where almost all infectious viruses may be disinfected. See ICPIC Abstract, Presentation, Poster and Passout A MP3 audio file of the presentation is available, but has to be synchronized to the PPT by the user. 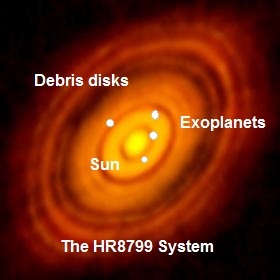 The discovery of exoplanets orbiting the distant star HR8799 supports the theory that exoplanets surround other stars in the Universe consistent with the planets that orbit our sun. See AJ paper. But the HR8799 System differs from our solar system as HR8799 is: (1) a young star containing large amounts of dust haloes not present in our solar system, and (2) emits UV radiation 3 orders of magnitude higher than our sun. But dust is a problem because even in the interstellar medium, far smaller quantities of dust affect all astronomical measurements of redshift, e.g., the Hubble redshift in an expanding Universe central to cosmology. In fact, dust requires requires corrections to measured Z to determine Hubble Z using the difference between the redshift of Lyman-alpha and H-alpha lines. If Z correction = 0, Z Hubble = Zmeas. But if Zcorrection > 0, ZHubble < Zmeas. Details are given in APRIM 2014 Cosmology and Cosmic Dust, 2014. For convenience, the APRIM paper may be opened here. Whether the dust debris of distant solar systems confounds IR spectra measurements to question the claimed discovery of exoplanets? Briefly, the IR spectra of HR8799 are not produced by molecular lines of common gases, but rather ny the QED induced redshift of UV radiation (Lyman-alpha) photons in dust NPs the of debris haloes. QED stands for quantum electrodynamics and NPs for nanoparticles. The consequence of QED radiation is the molecules thought measured by IR spectroscopy are in fact redshifted Lyman-alpha photons having a wavelength depending on the size distribution of the dust NPs between the perceived location of the planet and HR8799. What this means is exoplanets orbiting a distant star may exist, but any discovery cannot be proven using the IR spectra of common planetary gases. Young stars like HR8799 emit Lyman-alpha radiation that is absorbed in dust NPs of debris disks to produce IR spectra that could falsely be interpreted as proof of an exoplanet discovery - when in fact the IR spectra is an artifact of dust and the exoplanet does not exist. Expanding Universe or Cosmic Dust? QED induced EM radiation in cosmic dust NPs is proposed as the mechanism by which both AME and Hubble redshift may be used to asess an expanding Universe. QED radiation is a consequence of QM that denies the atoms in NPs under TIR confinement to have the heat capacity to allow increases in NP temperature upon absorbing galaxy light. In AME and Hubble redshift, the only galaxy light considered is single Lyα photons absorbed in spherical dust NPs of amorphous silicon. Ly stands for Lyman. Since NPs have high surface to volume ratios, the absorbed Lyα photon is induced by QED to be totally confined by TIR to the NP surface. Hence, the TIR wavelength of the QED induced photon is the NP circumference 2π a n, where a and n are the NP radius and refractive index. See Korean Paper However, the QED response of the NP to AME produced by the Lyα photon depends on its size, the maximum diameter 2a < 1 micron. In small NPs with a < 0.04 micron, the Lyα photon is conserved by spinning the NP, the dipole moments of which producing the AME; whereas, the larger NPs having a > 0.04 micron redshift the Lyα photon to produce VIS and near IR light. 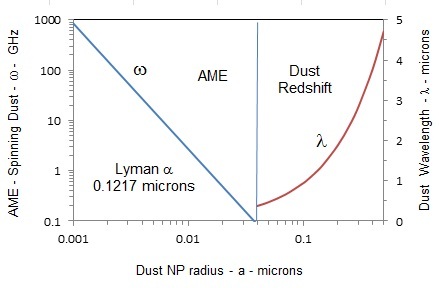 The AME frequency and Hubble redshift wavelengths in relation to the dust radius in the figure above. In QED redshift, NPs for a > 0.040 microns absorb single Lyα photons, i.e., blueshift requiring greater EM energy than that of the Lya photon cannot occur as the conservation of energy would be violated. The QED induced redshift Z in dust is, Z = ( λ - λ* ) / λ*, where λ and λ* are the wavelengths of the QED redshifted and Lyα photons. For a < 0.5 microns, the figure shows the redshifted wavelength 0.376 microns begins at NP radius a = 0.04 microns in the VIS to 5.7 microns in the IR. Larger NPs > 1 micron are required to produce QED induced UIR bands, but heating of NPs and PAH to produce IR emissions is precluded by QM. UIR stands for unidentified infrared and PAH for polycyclic aromatic hydrocarbons. With regard to AME based on classical physics, the absorbed Lya photon is dissipated by an increase in temperature, see e.g. Paper But temperature increases are forbidden by QM. Hence, the absorbed Lyα photon can only be conserved in the TIR mode of the NP. Since blueshift cannot occur, and since the TIR mode is tangential to the surface of the NP, the Lyα photon naturally produces circularly polarized light around the NP to exert a torqueon the NP. Hence, the the Lyα photon energy is conserved by the kinetic energy of spinning NP. Circularly polarized light in NPs is illustrated below by the E-field rotating normal to the NP surface upon Lyα photon absorption. QED induced AME conserves the Lyα energy hc / λ* with rotational energy ½ J ω2 of the NP giving the spin rate ω = √(2 h c / J λ*), where h is Plancks constant, c the speed of light, J the NP rotational moment of inertia, J = 2 ma2/ 5, and m the NP mass. For amorphous silica having density 2650 kg / m3, the figurel shows the spin rate ω over NP radii 0.001 < a < 0.04 microns corresponds to AME from 0.1 to 860 GHz. In summary, current AME mechanisms that excite NP rotation by IR emission from increased temperatures upon UV absorption cannot be valid by QM. Similarly, the UIR bands thought formed by increased temperatures of PAH molecules are not valid. Further, the AME is most likely caused by dust  not as a relic of gravitational waves in an expanding Universe following the Big Bang. The CMB spectrum therefore can only be caused by thermal blackbody radiation from a static Universe reaching an equilibrium temperature of 2.726 K over an infinitely long time. Covetics are new compounds formed by adding carbon NPs to molten metals (aluminum, copper, silver, etc.) that upon solidification enhance the yield strength of the metal. See Covetics overview. However, controversy surrounds how the Covetics bond forms with the metal. During thermal processing of Covetics, a known amount of carbon is added to the molten metal. Upon solidification, Covetics samples are taken from which the carbon bonded to the metal is thought given by the difference between the carbon added and that combusted by the LECO method. In LECO, a sample is heated in oxygen to 1500 C and the carbon content inferred from the CO2 produced by the chemical reaction with oxygen by infrared absorption spectrometry. But the bonding of carbon NPs to aluminum is questionable as the Covetics is observed to not change contrary to the law of mixtures that predicts ~10 % reduction in density. See above micrograph of carbon NPs in fracture surface of 6061 aluminum. A similar problem on density was found for copper. Moreover, the activation energy for the formation of the Covetics bond based on DFT has failed to show stable carbon-metal configurations. DFT stands for density functional theory. Both the law of mixtures and DFT suggest bonding of carbon to the metal lattice cannot be the Covetics mechanism. 1. Covetics by QED radiation depends on whether the carbons added to the melt are nano or microcarbons. In Al Covetics, adding NPs at ambient temperature enhances the yield strength by QED stiffening of the lattice, but NPs remain in the lattice. See QED stiffening of silver nanorods. 2. The failure of DFT to find stable metal-carbon atomic binding configurations and the lower density expected from the law of mixtures is consistent with the missing carbon inferred from LECO being combusted in thermal processing compared to the less favorable formation of carbon bonding to the metal lattice. 3. Covetic nanoscale films do not show NPs as the microcarbons are most likely toyallly combusted in thermal processing. Cancer Risk: Worse than bad luck? Science reported genomic changes occur in an organ simply by chance during DNA replication rather than as traditionally thought by carcinogens. Paper The study showed that although melanocytes and basal epidermal cells of the skin are both exposed to the same dose of UV from solar radiation, melanomas are much less common than basal cell carcinomas because the larger number of basal epidermal cells undergo a higher number of divisions than melanocytes. However, not all agreed. The contrarian argument may be made that cancer need not be proportional to the number of replications that the DNA undergoes, but by carcinogens that damage the DNA independent of replications. Melanosomes that form in the melanocytes contain melanin granule NPs that emit UV radiation causing DNA damage that leads to mostly basal cell carcinomas with few melanomas. NPs stands for nanoparticles. Indeed, it widely known the antimicrobial action of NPs is caused by damaging the DNA of bacteria, but by the same reason NPs also damage human DNA, that if not repaired, may lead to cancer. The human body naturally creates NPs that may damage the DNA, e.g., the breakdown of epithelial tissue which produces NPs associated with the spread of tumors. With melanin NPs, the cancer risk byUV radiation is depicted in the figure. Melanocyte cells located in the basal layer of the dermis have dendrite structures that penetrate into the lower epidermis. Melanosones having sizes of about 1 micron formed within the melanocytes pass through the outer tips of the dendrites into the dermis. Removed from melanocytes, the melanosomes are collections of < 100 nm melanin granule NPs. By QED induced EM radiation, the melanin NPs absorbing heat from the thermal surroundings cannot increase in temperature because of quantum mechanics. Provided the refractive index of the NP is greater than that of the cellular surroundings, the heat is conserved by QED inducing the melanin NPs to emit UV radiation, a condition that is satisfied for 30 nm melanin NPs having an index of 1.7 while that of the surroundings is 1.35. Paper In this way, the emission of UV radiation from the melanin NPs damages the DNA in both melanocytes and basal cells. But because of the small number of melanocytes in the basal layer, most DNA damage caused by the UV radiation from the melanin NPs occurs in the basal cells with little, if any DNA damage in the melanocytes. Basal cell carcinoma is therefore far more common than melanoma. Cancer risk may not be a matter of chance or bad luck. Rather, cancer may be caused solely by DNA damage from QED induced UV radiation in NPs. Setting aside DNA damage by chemicals, the hypothesis may be made that UV radiation from melanin NPs in melanocytes is the sole cause of cancers because of the DNA damage in surrounding tissue. But the NPs need not be limited to melanin - all biological and man-made NPs damage the DNA, e.g., the nicotine NPs that enter lung tissue by smoking. A literature review of cancer risk based on the presence of < 100 nm NPs in all cancers is required to further assess this hypothesis. Man knows life has a beginning and an end, and it is only natural to think the Universe also has a beginning and an end. Yet, for thousands of years, the Universe was considered static and infinite - without a beginning and end. However, Einstein in 1916 introduced his field equations that required the Universe to be finite and either contracting or expanding. Since a static Universe is foreign to human experience, Einstein provided a theoretical basis to suggest the Universe is not static, but rather began with the Big Bang. Lacking experimental proof, Big Bang theory lay dormant until 1929 when Hubble dismissed a static Universe by showing the light from distant galaxies was redshift. Interpreted by the Doppler Effect, the Hubble redshift was taken as proof the Universe is expanding ever since the Big Bang. However, Big Bang theory was recently questioned by replacing classical geodesics with quantum trajectories. Quantum-corrected Friedmann equations derived within the context of general relativity showed the singularity of the Big Bang does not exist. The quantum corrections can be thought of as a cosmological constant term without the need for dark matter and energy. The Universe is assumed filled with gravitons — hypothetical massless particles that mediate the force of gravity, but if gravitons do exist have been shown to form a Bose-Einstein condensate at any Universe temperature, otherwise thought to require the high temperatures of the Big Bang. 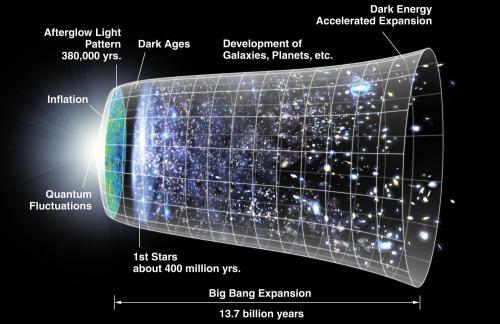 Quantum trajectory theory like the Big Bang is a still a theory. Experiments are required to show the existence of the graviton, but like the Higgs boson in Big Bang theory, the existence of the graviton has not been verified. Regardless, quantum trajectory theory lacking dark matter and energy leading to a static Universe is contradicted by Hubble redshift based on the Doppler Effect that shows the Universe is expanding. QED induced redshift in cosmic dust NPs is proposed as the non-Doppler redshift to replace Hubble redshift by which the Quantum theory may avoid dark matter and energy consistent with a static Universe. QED stands for quantum electrodynamics and NPs for nanoparticles. But this does not mean the Universe is expanding as QED redshift by replacing Hubble redshift also leads to a static Universe. Unlike Quantum and Big Bang theories, QED redshift of galaxy light in NPs may readily be confirmed in laboratory experiments. In conclusion, Big Bang theory relies on Hubble redshift of galaxy light by the Doppler Effect as proof of Universe expansion, but requires verification of the Higgs boson or the presence of dark matter and energy. Quantum theory based on trajectories instead of classical geodesics mediated by gravitons leads to a static Universe without the need for dark matter and energy, but Hubble redshift is required to be replaced by QED redshift in cosmic dust. Anti-microbial peptide disinfection by QED? AMPs are thought to disinfect bacteria by disrupting cell membrane integrity, thereby inhibiting DNA synthesis. AMPs stand for anti-microbial peptides. Generally, AMPs are considered cationic and carry a positive charge that ensures Coulomb attraction to the negatively charged cell membrane. Upon docking, AMPs form pores by burrowing into the cell interior to lyse bacteria, but how cationic charge is maintained during burrowing is not explained. However, AMPs forming pores in the cell wall are not the only mechanism by which bacteria may be disinfected. Indeed, one third of the total proteins of a bacterial cell are associated with the membrane and have many functions that are critical to the cell including active transport of nutrients, respiration, proton motive force, ATP generation, and intercellular communication, all of which can be altered with AMPs even if complete cell lysis does not occur. Therefore, the killing effect of AMPs may not come from membrane disruption alone, but also depends on complex inhibition of protein functions. Given that AMPs induce lysis for different cell types and diverse bacteria other than by disrupting membrane integrity, AMPs disinfection and inhibition of complex protein function can only be caused by a common and more fundamental disinfection mechanism for all organisms. 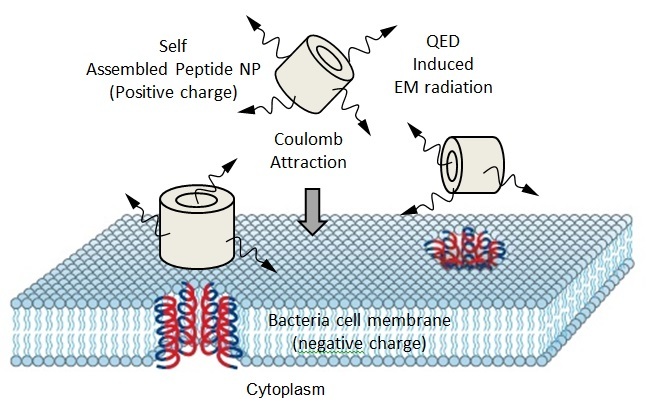 On this basis, AMPs are proposed to produce QED induced EM radiation upon self-assembly of helical peptides into annular shaped cylindrical NPs. 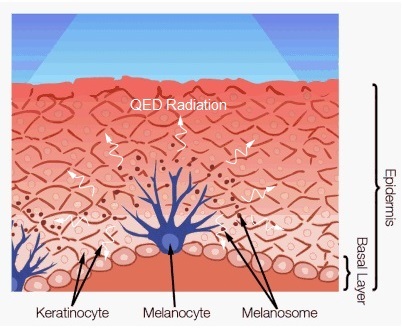 Depending on the size of the NPs, the QED induced EM radiation varies from the UV to the EUV thereby identifying ionizing EM radiation as the fundamental AMPs mechanism underlying the disinfection of all organisms UV and EUV stand for ultraviolet and extreme ultraviolet radiation. Cyberwood may also find application as a temperature distance sensor as shown in the thumbnail. At each position, the body heat of the hand was held for 30 s and then rapidly moved away. The current measured across the sample ramped to a different value and then decreased to a reference value corresponding to a temperature of 23 °C. The TCR for Cyberwood as a distance sensor is estimated as follows. The voltage V across the sensor is constant, and therefore the current I is related to the resistance R by, I =V/R, or ΔI/Io = - ΔR/Ro. Here, Io and Ro are the initial current and resistance of the sensor. For the first current spike shown in the thumbnail, ΔI/Io ≈ - 0.02, and therefore ΔR/Ro = - 0.02. Now, the TCR = (ΔR/Ro)/ΔT K-1, where ΔT is the change in sensor temperature. For the adult human, the body heat Q is, Q ≈ 6 mW/cm2. The Cyberwood sensor is 1 cm x 2 cm x 3 mm with the area A = 2 cm2 exposed to body heat Q. The thermal energy U deposited in the sensor is, U = QAt, where t is the exposure time, i.e., for t = 30 s, U = 0.36 J. The sensor temperature change ΔT is, ΔT = U/ρvC, where ρ = 1000 kg/m3, v = 6x10-7 m3, and C = 2500 J/kg/K giving the ΔT = 0.24 K. Hence, the TCR = 0.083 K-1 = 8.3 % K-1. An audio MP3 file is available of the presentation including the discussion with attendees, the clarification of which is briefly described, i.e., a large number of molecules in a macroscopic balloon under EM confinement at long wavelengths obey classical physics and increase in temperature consistent with statistical mechanics. But if the balloon is nanoscopic, QM prevails because the molecules under the short EM confinement lack the heat capacity to change in temperature. QM stands for quantum mechanics. Indeed, the perfect gas law is not valid in nanoscopic balloons. Also, applying a temperature to a nanocoating does not produce a temperature gradient because the atoms under the short EM confinement of the coating cannot increase the temperature by QM. Instead, the atoms in the coating produce QED radiation that charges the coating or is lost to the surroundings. Thomas Prevenslik is a retired American living in Hong Kong and Berlin. 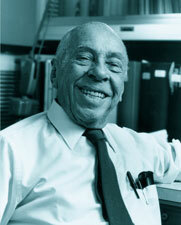 He spent most of his career in the USA performing classical ANSYS and NASTRAN computer simulations of optical telescopes at Owens-Illinois and nuclear reactors at Westinghouse. Because classical physics cannot explain experimental observations at the nanoscale, he developed the theory of QED radiation based on quantum mechanics. By this theory, nanostructures having high surface to volume ratios confine absorbed EM energy to surfaces thereby providing high frequency EM confinement of interposed atoms that by the Planck law requires their heat capacity to vanish. In contrast, classical physics assumes the atom has the same heat capacity at the nanoscale as at the macroscale. By quantum mechanics requiring a vanishing heat capacity, conservation of absorbed EM energy therefore cannot proceed by an increase in temperature, and instead proceeds by QED creating EM radiation inside the nanostructure that charges the atoms, and if not, is emitted to the surroundings. QED radiation is applicable to diverse areas of nanotechnology including cancer research, molecular dynamics, cosmology, and the instant topic of disinfection of drinking water in China.